Have you ever looked at a logo and thought to yourself, “That thing looks so simple. I could design that in 5 minutes!” And yes, you’d be correct if all you had to do was type out a word in a specific font and color. But logos are much more than that. They are complicated, yet simple. Fun, but also adhere to strict design principles. Even in logos with chaos, usually the chaos is controlled and meaningful. Throughout the years I’ve met really amazing clients, and ones that weren’t so nice. I’ve had super detailed design briefs and clients who’ve basically let me do whatever I wanted to do. I’ve even had clients tell me since I’m such a great designer, it would only take me 1 hour to do what they could probably do in 8 hours. So they want to pay me for 1 hour of my time to design the logo for their multi million dollar business. Honestly, if they really understood what went into creating a logo for their company, they wouldn’t be able to say that to me in good conscience. But I understand. It’s about the bottom line and turning a profit. But if your company is that important and valuable, why would you want to spend the least amount of time and money to create the look, feel, and brand for it? You can go on some websites and even get logos designed for $5. Seriously. 5 bucks. But you get what you pay for. They won’t spend the time, effort, and energy to get to know what your company does, product or service it sells, how it’s positioned within the industry, and how to create something that will help it stand out from the rest. That’s the difference. A viewer may see the end product and think how easy it would be to design that. But they don’t see the countless hours of research, sketching, thinking, more sketching, developing ideas, and then getting on the computer and creating some successful design solutions. With that said, I thought it would be nice to show you a logo job I’ve been working on. I started with some mind mapping, sketching, and then some designs on the computer. 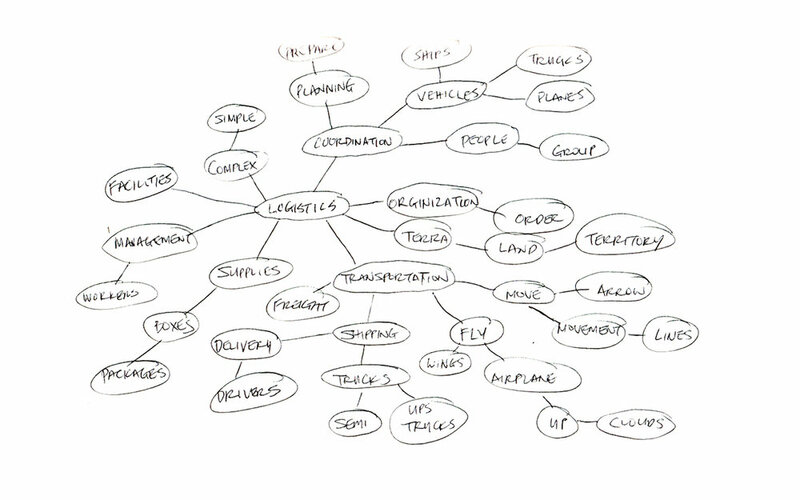 Mind mapping is a great way to get your thoughts cohesive and see if there any design directions that you didn’t really think of. Also, sketching is very important! I think too many of us just jump to the computer to start designing something when we could really explore some great ideas with some quick sketches. The sketches don’t have to be perfect. They just need to get you to start thinking and seeing what the possibilities could be. So the next time you see a logo, think about what “really” went into designing that “simple” logo. Mind mapping for Terratrans Logistics. Sketching some options for the three letters TTL the client wanted to incorporate. Final options submitted to the client for review.